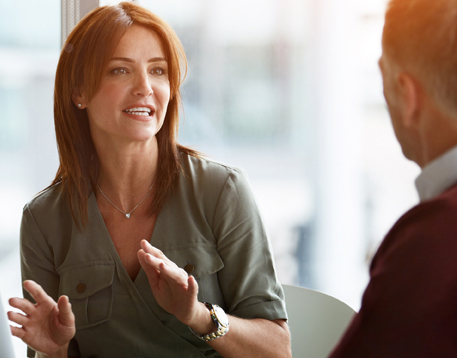 Spend June 21st and 22nd in beautiful Annapolis brainstorming with thought leaders of other leading addiction treatment programs about how to improve your center's outcomes. All participants will receive a detailed summary of their center's INSIGHT Addiction results to date and leave with a detailed action plan. We can promise you - Vista's inaugural Outcomes Summit will be unlike any other conference you've ever attended! The catch is, you must register by June 1st! For patients struggling with severe withdrawal symptoms, answering questions about traumatic thoughts or disordered eating behaviors may be premature. 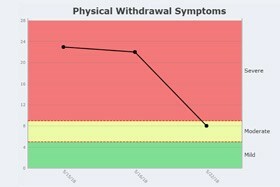 INSIGHT Detox, available at no extra charge to INSIGHT users, focuses on the issues that are top-of-mind to the patient during this difficult time -- their physical & emotional withdrawal symptoms and their cravings. Learn more here. 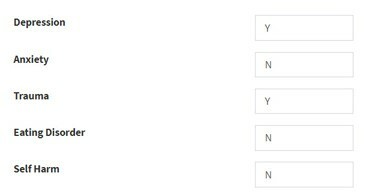 Want better control over which members of your team can access the patient data and receive notifications for specific groups of patients? It's now easy to assign your counselors and managers to specific programs such as residential or IOP. Learn more here. Have you been struggling to get parental permission for adolescents to use INSIGHT? With a click of a button, you can now send parents an email or text request to the address or phone number their child provided! Learn more here. Have you become concerned that a patient might be struggling with an issue such as anxiety or an eating disorder that INSIGHT hasn't been monitoring him or her for? Simply click on the 3 buttons to the right of the patient's name on your list of patients and select "Modify Survey". Then, for any condition you want your patient to be monitored for, change the "N" to a "Y". We've created patient handouts for INSIGHT and RECOVERY 20/20 that explain the purpose behind Vista's research and encourage patients to actively participate. We recommend that programs hand a copy of the INSIGHT flyer to each patient prior to their being asked to enroll in INSIGHT. 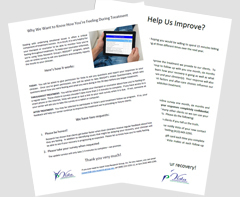 For programs doing RECOVERY 20/20, we recommend that all patients be handed the RECOVERY 20/20 flyer and encouraged to participate in the post-treatment follow-up as part of their exit interview. Download the flyers here. With more than 3.8 million views to date of John Oliver's expose of the addiction treatment industry, it is more important than ever to be able to differentiate your treatment center from the charlatans. 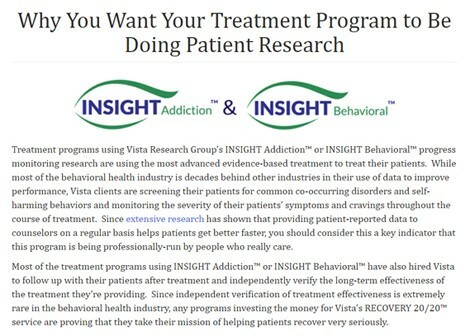 INSIGHT clients may include Vista Research Group's logo on their website with a link to this page that explains that your center is a leader in the field of research-driven addiction treatment. Separately, if you'd like visitors to Vista's website to be able to find your center, email a high-resolution version of your logo to support@vista-research-group.net and we'll post it on our website with a link to your site. Your clinicians can use the "Additional Information" section at the bottom of each patient's dashboard to record their impressions of and planned response to each survey's INSIGHT results. This documentation will make it easy to show that your clinicians are using the patient-reported data to inform clinical care as required by JCAHO's new outcome measures standard.